When a 55-year-old man went to the Hospital complaining about difficulty in swallowing and cough for some days. The patient and the Doctors were expecting it to be health issue, but with some investigation they find out that the patient had suffered a seizure 5 days back and lost part of the removable denture. Without much thought he continued with his life and was facing some difficulty in his chest along with difficulty in swallowing along with a little bit of cough. The consultation to the Doctor came when the cough and the swallowing difficulty became severe. 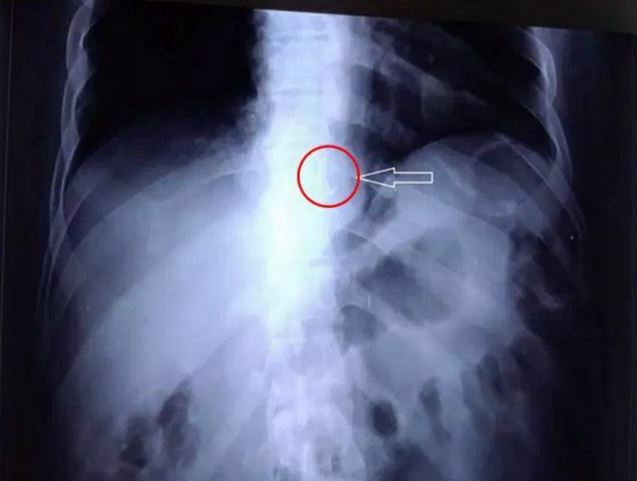 When the doctors took a Chest Xray for diagnosis, they were in for a surprise with the missing denture lodged in the oesophagus. It was lodged 32cms from his mouth. Doctors then tried to remove the lodged denture using alligator forceps which was unsuccessful and sent it even further down. The denture was successfully removed with the help of rigid endoscope. Luckily there was no major injury to the oesophagus and all ended well. One of the major concerns with the Removable partial Denture is the patient swallowing the denture and getting lodged in the oesophagus which can be a major problem with the sharp edges of the denture. As Dentists, we make it a point to reject removable partial dentures to patients suffering from Seizures or have any history of seizures.Along with that the dentures should be removed while sleeping as there is a chance of getting loose and being swallowed. I can just imagine how horrible it must have felt. I think these cases are really rare? I have never come across similar to this, even though I read a lot of dentistry blogs. I’m not a dentist myself, but these issues interest me! Same thing happened to me but my case is very different from this because in mine the denture was never removed from my Eosuphagus. Is the denture still present in your oesophagus ? What is the reason for not getting it removed ? ?